New Year’s Eve is almost here! Are you ready for 2016?! Update: 12/2018- Sorry, the (very) short video that once accompanied this tutorial is no longer with us…at least, for now ;0) -Luckily, this design is so simple to create that I can tell you all that you need to know! The most important thing is that coloring gels mixed with a very small amount of everclear, vodka, or lemon extract will give you a watercolor-like consistency of paint which will allow you to decorate your cakes in the most beautiful way! I prefer a small, soft paintbrush when painting color onto buttercream, and I also highly recommend using a crusting vanilla buttercream for your frosting as I mention in the notes below. After the frosting has crusted, you can lightly tap over the cake with your colors. Start in back until you get the hang of it! I added a small bead border of buttercream around the top, bottom, and circle in the middle (which was first marked with a circle cookie cutter), and I painted our numbers with gold luster dust. Painted decorations like these are the perfect way to add a little life and personality into all sorts of cake designs. We hope you’ll give it a try! Of course this design works for any size cake, but mine is a 6 inch double barrel (tall!) cake, frosted with this Classic Vanilla Buttercream recipe. Any crusting frosting will do. If it doesn’t crust, you won’t be able to paint it as easily. Vodka or lemon extract (the alcohol makes the “paint” dry quickly). Coloring Gels: I used Americolor Lemon Yellow, Orange, Deep Pink, Sky Blue, Bright white, and Electric Green. Use whatever colors you like! Sparking Sugar &/or sugar pearls- Optional. I used on top of the cake. Number cutters- (Mine are Wilton). 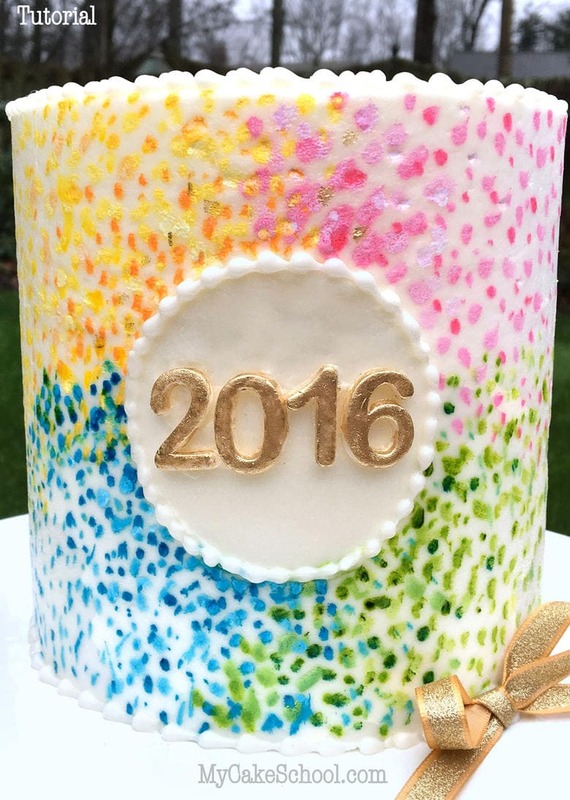 You could also either pipe the 2016 in buttercream or with melted candy coating. If you use candy coating, pipe your numbers onto a waxed paper or parchment lined cookie sheet, chill for a few minutes until firm, and place onto the cake with a bit of buttercream. Circle cutter- Optional -I used this to map out the circle on my cake (it was a 3 inch diameter). You could improvise with a glass or even a white circle of fondant. Gold Luster Dust- I like Rolkem Super Gold. Would also be pretty with painted colorful numbers! Viva paper towel & fondant smoother optional- For this cake, I used a Viva paper towel to smooth my room-temp, freshly frosted & crusted buttercream. Crusting buttercreams will crust in 5-10 minutes or so. I frost my cakes, smooth with a bench scraper (or spatula if you don’t have a bench scraper), allow to crust, and smooth with a Viva. Remember that if you frost a cold cake with a crusting buttercream, it will take forever to crust due to the additional moisture. Always frost your final coat of buttercream when the cake is room temperature so that it will crust properly! I have never tried painting onto chilled/frozen buttercream. I prefer to paint on crusted (room temperature) frosting. However, if the frosting isn’t crusting properly for you, you can chill the cake until just firm and then proceed with painting. I had a glass of water nearby to clean my brush as I moved from one color to the next. I spaced my coloring gels around my palette, and filled a couple of the wells with vodka. Then I would mix the color in the center with a touch of vodka (which makes the paint dry quickly). Use a very light touch with your soft paintbrushes. I like to hold my brush at an angle when applying the color. I also let the spots of color mingle a bit as I moved from one shade to the next. When painting my gold numbers, I mixed my gold luster dust with a touch of vodka to create a paint (thicker than the coloring gel paint). I painted my numbers, allowed them to dry for 5-10 minutes, and then dusted over them with dry dust for a little extra sparkle. I placed them on with a bit of buttercream. There is really no wrong way to do this! Have fun with it, and thanks for stopping by! That looks terrific! I love the colours. Very clever as always. Happy New Year to you and your family. I wish you all a Happy, Healthy and Prosperous 2016. Love how you are always trying new things out and showing us. Happy New Year!! So cute!! Happy new year! !